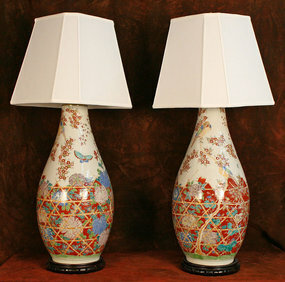 Exceedingly rare and very large Japanese Meiji Period Imari Porcelain Vases Adapted as Lamps. 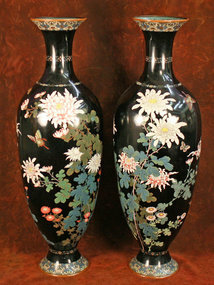 These great vases are one of a kind, not to be seen or found again. Gorgeous, rich, colorful glazes featuring flowers and birds with a charming fence design, all featured on a translucent white glaze. Height: 41 inches, 104 cm. 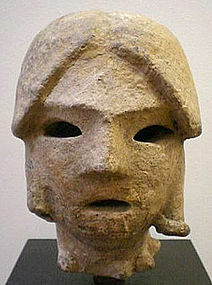 Tumulus Period (AD 250-552) Clay Haniwa (Haniwa means “circle of clay”) forms were installed in the tumuli (burial mounds) that were built throughout Japan from the Third to the Sixth centuries. 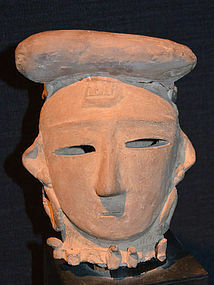 The Haniwa formed part of the rites used in sending off the dead. 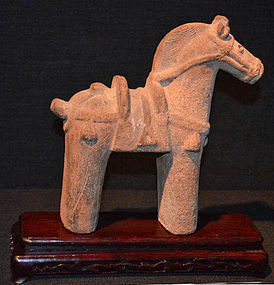 Today, these Haniwa, made in the shape of buildings and possessions which do not exist now, and also in the form of animals and even people, show us what things were like in those times. This Japanese Haniwa of a Woman’s Head is an important find that has the qualities museums and collectors of fine art look for. 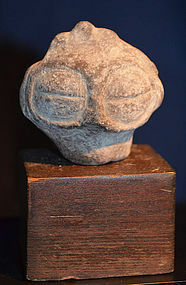 Head: 9 inches (23cm) high, Head with base: 13.5 inches (34.5cm) high. Unglazed clay. 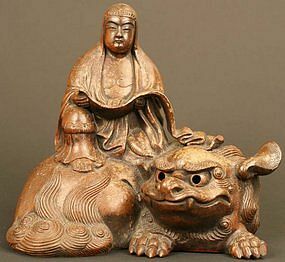 A spectacular Edo Period Bizen Ceramic Sculpture representing the Goddess Kannon riding a Shishi. This is an early and Museum Quality piece used as a Brazier Cover in the tea ceremony, used by the highest class. 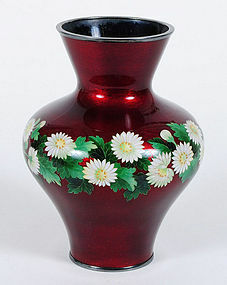 8 inches (20.5 cm) high. Excellent Condition. 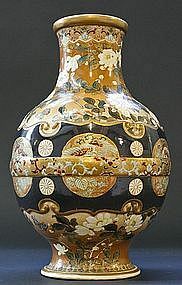 Mid 18th Century. 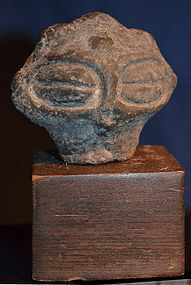 From a prominent and widely exhibited collection. 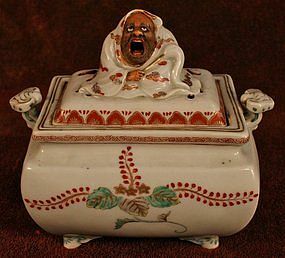 Magnificent 18th Century Japanese Edo Period Kakiemon Porcelain Incense Burner with Daruma, the founder of Zen Buddhism. 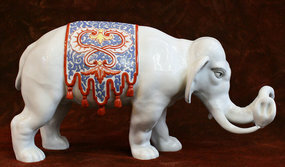 Delicately painted designs in vivid and varied colors. A wonderfully rendered Daruma adorns the cover where the smoke magically appears out of his mouth when incense is burned. A very rare and remarkable piece in very fine condition. 5.5w x 4.5h x 4d, 14w x 11.5h x 10 cm. 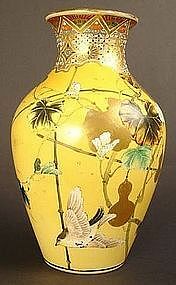 Delightful Kutani Porcelain Vase with Array of Insects. 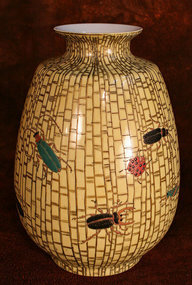 Bamboo gold design on a soft yellow ground featuring an array of insects. It is a rare and unique design on a wonderful classic shape. It displays beautifully from all sides. Height: 9.25 inches, 23.5 cm. 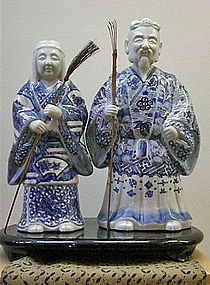 Japanese Meiji Period Blue and White Arita Porcelain Sculpture of Jo and Uba, an old and wrinkled couple who care for the pine trees and gather needles in Takasago, (based on a Noh play). Jo is depicted with a rake and Uba with a broom of twigs. This famous couple symbolizes Marital Love and Fidelity, and were created by Arita porcelain masters to bring marital bliss to a home. 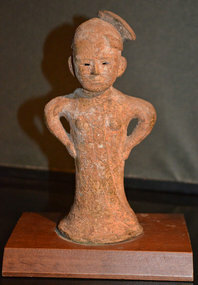 Male: 14.5 inches (37cm) high, Female: 13 inches (33cm) high.